Keeping kids and pets safe requires setting some ground rules for safe pet play. But things can quickly get out of hand if we don't set appropriate boundaries between the two. For example, kids love snack time. Pets, too, love to eat. Mix the two, and one or the other is going to get cranky. These 9 pet safety tips can help keep kids and pets safe - together. This first of the pet safety tips is an important one, for both the child and the pet. Supervise kids age 4 and under when they're playing with a pet. Puppies have sharp little teeth. And cats get really cranky when three-year-olds try to ride them. To keep everyone safe and happy while encouraging a positive interaction between the two, make sure there's always an adult overseeing pet-kid playtime. Be aware that pets do not share food well with others. In fact, pets can get quite territorial during chow time. Teach kids not to pet, play with, or otherwise disturb a pet while it's eating. Kids love to walk the dog. The dog loves walking. But no child should walk a dog unattended - at least not out of the neighborhood. What if another dog attacks them? The child could be hurt. But it's up to you, the parent, to decide at what age a child is responsible enough, and the neighborhood safe enough, that they may do so alone. In general, kids under age 8 aren't responsible enough to walk a dog safely alone. Keep young kids with snacks away from dogs. They might lose a finger as well as the snack. See #2 above. 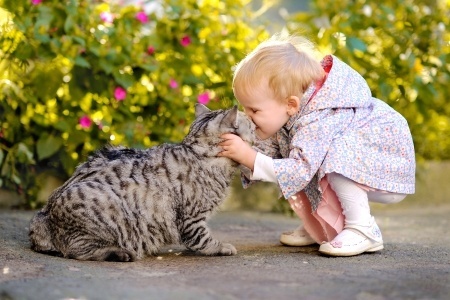 Everyone in the family should remember to wash their hands after playing with pets - or at least use a hand sanitizer. This will help prevent the animal-to-human transmission of zoonotic diseases. Pregnant women and small children get a pass on cleaning the cat's litter box. Young kids and the immune-compromised also should not clean aquariums. Wear plastic or other disposable gloves when you or a child will be coming into contact with pet feces. This includes when scooping the litter box, doing pooper scooper duty on a dog walk, or cleaning up pet accidents. No reason to touch the icky stuff, right? This is one place you don't want to take chances. If you have an outdoor sandbox, keep it covered when the kids aren't playing in it. That way, birds and neighborhood cats don't mistake it for an invitingly large litter box. Animal instincts keep most pets from seeing the difference between play aggression and the real thing. Act accordingly by supervising kids and animal play and keeping it tame. Get the e-book on all things pets and family now!